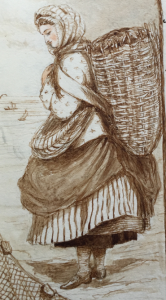 Recently acquired by Edinburgh University Library is a fine bound manuscript volume of cookery and recipes compiled initially by Lady Nina Balfour of Balbirnie and then continued by Victoria Alexandrine Montagu Scott. 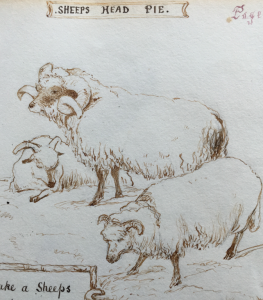 The volume was gifted by Balfour to Scott in about 1864-65, presumably in anticipation of her coming marriage, and was added to over some eighty years at Monteviot House (the Borders home of the Marquis of Lothian and the Kerr family). 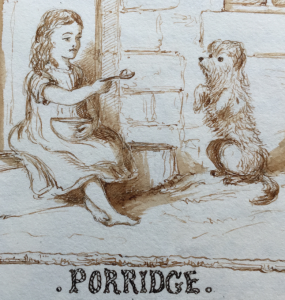 Spanning the Victorian and Edwardian eras and encompassing two World Wars, the recipes in the ms volume form an interesting chronicle of the Scottish country house diet. 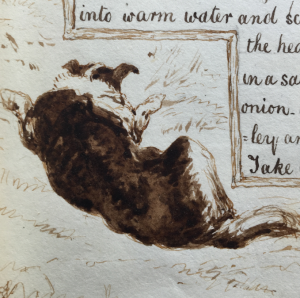 The opening pages created by Lady Nina Balfour are decorated with recipes and illustrations for Scottish staples, such as: Sheep’s Head Pie, Cockie Leekie, Porridge, Fish & Sauce plus Kedgeree and Boiled Cheese. Lady Victoria then takes over, with the book remaining in her family for the rest of her life and updated to 1945. The Victoria Alexandrine recipes are varied: chicken curry, several hotch potches, flan Germanique, Spanish Salad, ginger beer, liniment and chocolate cake. These are often dated from Monteviot and with a note of sources… Monteviot House in the Borders is the residence of the Marquess of Lothian. 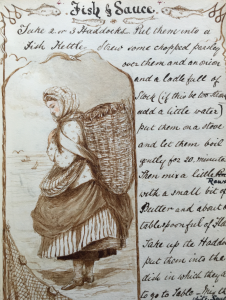 This entry was posted in Collections and tagged Balbirnie, cookery, Monteviot, recipes on 19/05/2016 by eddiegd. 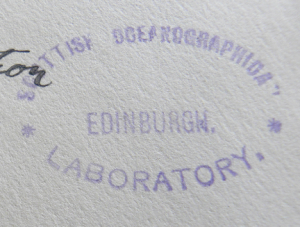 …Some 17-months after his departure from South Georgia in October 1915, Ernest Shackleton suffered the loss of his Expedition ship Endurance which had been sunk by the pack ice of the Weddell Sea. The Expedition – 28 men – had been left adrift but surviving on the ice along with the small lifeboats and other equipment that could be rescued from the ship. 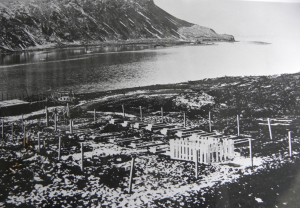 By April 1916 however, the ice was beginning to break up and the Expedition took to these lifeboats and made for Elephant Island in the South Shetland Islands. They landed on the small island on 15 April 1916. Elephant Island was remote from anywhere that the original Imperial Trans-Antarctic Expedition had planned to go, and the likelihood of rescue from the bleak and inhospitable island was slight. Shackleton decided therefore that the most effective means of obtaining rescue would be to sail one of the lifeboats into the prevailing winds and make for the whaling stations of South Georgia some 1,500 kilometres away (800 nautical miles, or 620 miles). Choosing five companions for the journey and selecting the strongest of the lifeboats – James Caird, named after a major sponsor of the Expedition – the boat was launched on 24 April 1916. 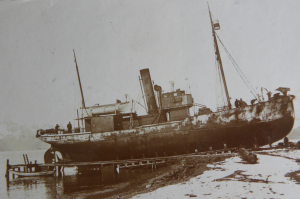 With Shackleton were Frank Worsley (the captain of Endurance) as navigator, Tom Crean (an Irish seaman), John Vincent (a trawlerman), Timothy McCarthy (an Irish seaman), and Harry McNish (carpenter) who had refitted the James Caird for the journey, masting and rigging it out as a ketch. The other 22 men would have to remain on Elephant Island and wait for the outcome of this vital journey. They had fresh water, and plenty of seals and penguins to provide food and fuel for their survival there. 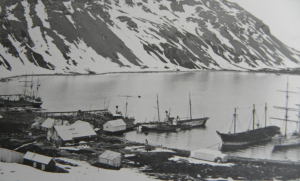 On 10 May 1916, after over two weeks in the cold open ocean, Shackleton and his men landed their boat at Cave Cove, near the entrance to King Haakon Bay, South Georgia, albeit on the wrong side of the island from the manned stations at Prince Charles Harbour, Stomness, Leith harbour, Husvik, Grytviken, Godthul and Ocean Harbour. From Cave Cove James Caird was sailed a bit further and beached on shingle near the head of King Haakon Bay itself and then it was turned over to provide shelter and the makings of a ‘camp’. After a period of rest Shackleton, Worsley and Crean set off on 18 May – without a map – on an overland trek across mountains and glaciers making for the whaling station at Stromness, leaving McCarthy, Vincent and McNish behind at the King Haakon Bay ‘camp’, the latter two far too unfit to walk. After 36-hours of trekking what would become the first confirmed land crossing of the South Georgia interior, the three reached Stromness. On 19 May, the whaling vessel Samson with Worsley aboard was despatched to King Haakon Bay to pick up McCarthy, Vincent and McNish. 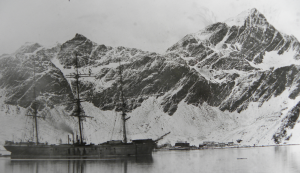 It would be another three months however before Shackleton was able to rescue the 22 men at Elephant Island. This was achieved with the assistance of the steam-tug Yelcho in the service of the Chilean Navy and under the command of Luis Pardo Villalón. All the men were saved and reached Punta Arenas, Chile, on 3 September 1916. 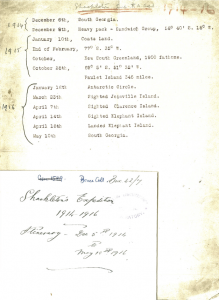 For Shackleton, army and diplomatic service followed – spending time in South America, northern Norway and in northern Russia – and he entered the lecture circuit too. 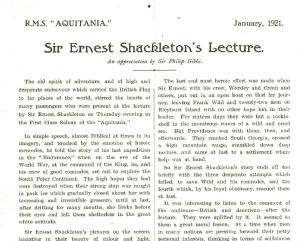 Indeed in January 1921 he was aboard the R.M.S Aquitania giving a talk in the first class saloon. He was no stranger to this circuit of course and was already a public hero prior to the Imperial Trans-Antarctic Expedition, having headed the successful Nimrod Expedition, 1907-1909. After that earlier 1907-1909 Expedition, Shackleton had received many official honours and he was greeted with great enthusiasm around the country. 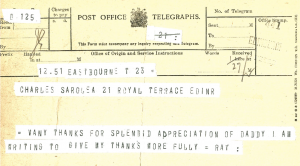 In 1912, Charles Sarolea – then head of French at Edinburgh University and whose second wife was Shackleton’s sister-in-law – had written to the explorer asking him to ‘do a review, however short, of Amundsen’s book on the South Pole’. 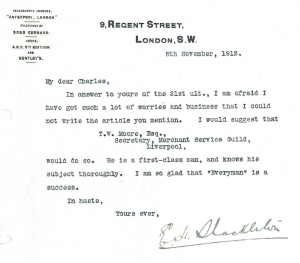 Reflecting his strenuous schedule of public appearances, lectures, social engagements, and business ventures, Shackleton had to reply that he had ‘such a lot of worries and business that I could not write the article you mention’. He was however able to congratulate Sarolea on the success of his magazine Everyman. In the years following his return from the interupted Imperial Trans-Antarctic Expedition, Shackleton soon tired of the lecture circuit and in September 1921 he left again for the Southern Ocean – the Shackleton-Rowett Expedition – and he arrived in South Georgia in January 1922. On the journey south he is believed to have suffered a heart attack – in Rio de Janeiro – and only a few hours after his arrival in Grytviken he died. His wife asked that her husband be buried in South Georgia and he was laid to rest in Grytviken cemetery. A memorial bust to the Chilean officer ‘Piloto Pardo’ (Luis Pardo Villalón) was later erected on Elephant Island and, today, visiting ships on the Antarctic cruise circuit frequently stop close to it. 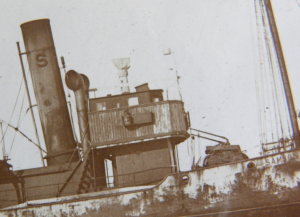 The James Caird was shipped to Liverpool arriving in December 1919. Today it is preserved at Dulwich College, London (Shackleton was an ‘Old Alleynian’ of Dulwich College). 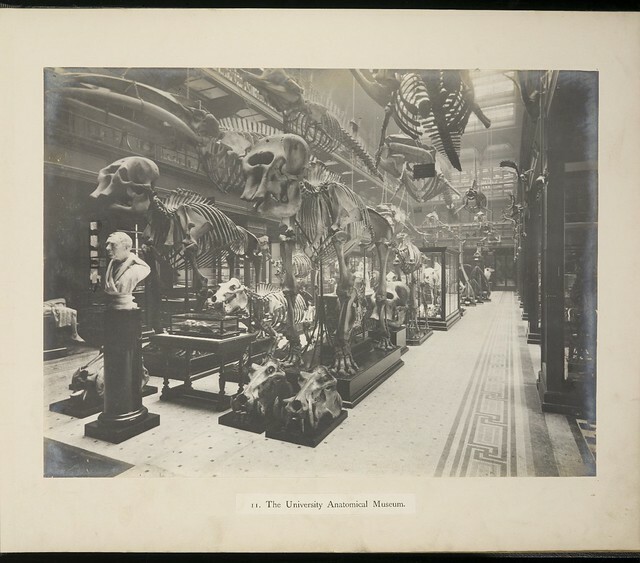 This entry was posted in Collections and tagged Christian Salvesen & Co. Ltd., Salvesen & Co., Salvesen Archive, Sarolea Collection on 09/05/2016 by eddiegd.